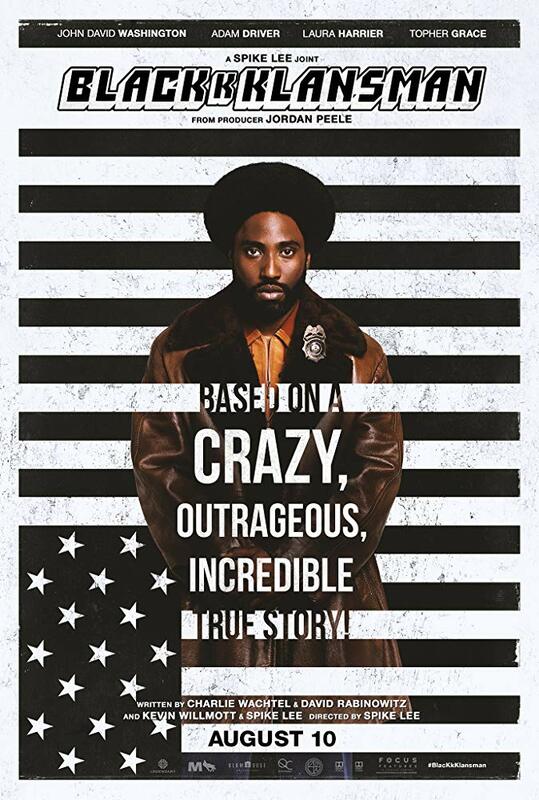 Based on the true story of Ron Stallworth, an African American police officer in Colorado Springs, who infiltrated the Ku Klux Klan. Despite my irritation with Lee’s approach to filmmaking, this is probably the best movie I’ve seen from him. It tells the true story of Ron Stallworth (John David Washington, forthcoming The Old Man & the Gun) an African American cop living in Colorado Springs, Colorado. 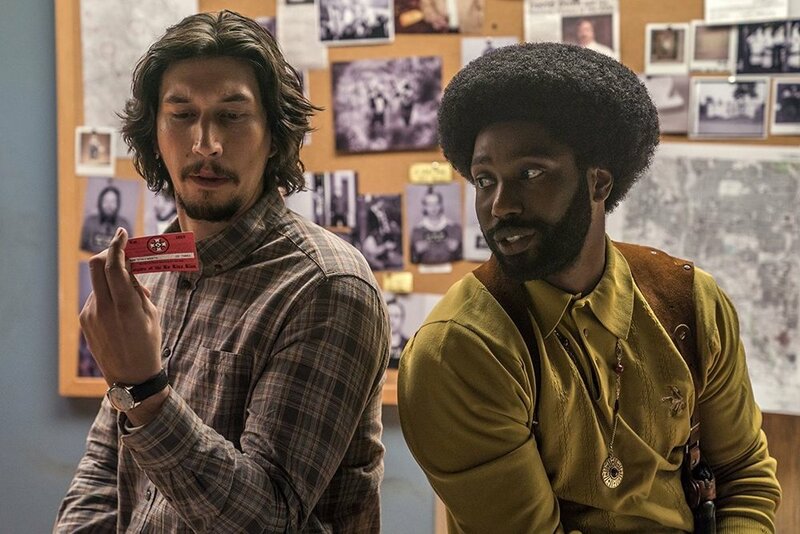 Stallworth, with the help of a Jewish American named Flip Zimmerman (Adam Driver, Inside Llewyn Davis), infiltrates the KKK, and helps uncover a terrorist attack that will soon be perpetrated. Together, along with the other cops on the police force, Stallworth and Zimmerman must stop the KKK from committing this heinous act. The story itself is interesting; even more so because it’s true. First off, I really liked the acting in this film. John David Washington, in his first major role, showed he has real potential to be a lead actor. Adam Driver is remarkable as he always is. The best-acted scene in the whole film, in my opinion, was when Zimmerman and Stallworth are in the police station discussing Zimmerman’s Jewish heritage. Zimmerman says that he never really used to think about it, and now he thinks about it all the time. Laura Harrier (Spider-Man: Homecoming) also did a fine job as Patrice Dumas. I thought the biggest surprise was actually Topher Grace, who was able to play the despicable David Duke with a cold sense of charisma. The things Grace says are horrible, but he says it so kind-heartedly that the juxtaposition is rather jarring. One problem with this film is pacing. This movie is two hours and fifteen minutes long, and there’s no need for it to be longer than an hour and forty-five minutes. There are scenes that are straight up boring, and have no real impact on the plot. There are scenes that are drawn out to be overly long, just to hammer home the same point that was already made at the beginning of the scene. There are scenes for subplots that could’ve been cutout entirely. My brother and I saw this film together, and both of us made the comment that the film was at times a little boring. My biggest problem with this film, as I mentioned before, is the heavy-handedness. There are many parallels drawn from the time when this story took place to now, and Spike Lee overemphasizes this until it’s impossible to miss the allusions he’s making. He has characters chant “America first,” as an obvious jab at Trump. There’s also a scene where Grace talks about “Making America Great Again,” another obvious jab. Lee even ends the film with footage of Trump talking about the Charlottesville rallies, and his notorious comments of how there were bad people “on both sides.” Look, I don’t like to get overly political on this blog, because this is a movie blog, not a political blog- but as this movie is primarily about politics I feel a little need to weigh in. I’m not at all a fan of Trump, as any of my friends or family could tell you, and I have no problem with movies taking shots at him. This is America; we have freedom of speech for a reason. If the KKK can voice their opinions, so should those who stand against them be given a voice; and hopefully the voices of love will always overpower those of hate. The problem Lee runs into when he continuously throws these connections in our faces is that the message looses its impact. Subtlety is important in a film; it allows for collaboration with the viewer and the film maker- where each viewer is allowed to take away their own messages and distill their own opinions from the film. When Lee shoves his messages down our throats repeatedly, I loose interest. He’s saying the same thing, over and over again, almost to the point where its insulting the viewers’ intelligence. I’m not stupid, Lee; I got your point the first dozen times you spelled it out for me. I feel like I have to reiterate that this movie is probably the best Spike Lee that I have personally seen. I guess I’m just not a fan of Spike Lee, and that’s fine. He’s a filmmaker with a voice, and many people are drawn to that voice like it’s a siren song. For me, his brash, ham-fisted way of telling stories doesn’t lure me at all; it simply sounds like an angry man shouting truths that everyone already knows. You might like this movie more than I; it’s one of the better-reviewed movies of the year. For me, it was fine, but this year’s Blindspotting approached the same issues with far more cinematic ingenuity, it was far subtler, far more fun, and in my opinion, it was twice as impactful as this.